Street food in the rest of the world is fantastic — as good or better than what is served inside four walls. Street food in the US can also be fast, inexpensive, and very good. Not just tacos. I’ve eaten at great food trucks in San Francisco, Portland, New York. Why don’t we see more of them? This is a serious question. Do they not make enough money? Are they thwarted by restaurant lobbies? Overzealous health codes? Nervous neighbors? I can’t believe there is no market for them. 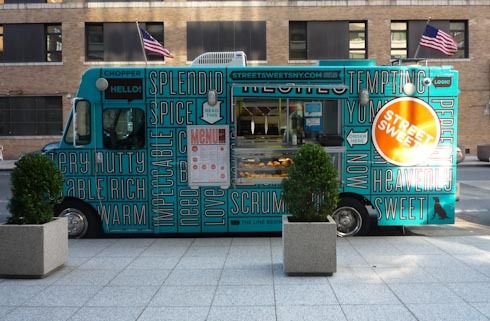 Why aren’t food trucks everywhere? Update: From the comments there is a suggestion of a website devoted to promoting food trucks. Looks useful: Mobile Food News. Food Truck Culture is alive and well in Los Angeles. The scene abounds with unusual ethnic combinations like Korean-Mexican, which took off several years back. 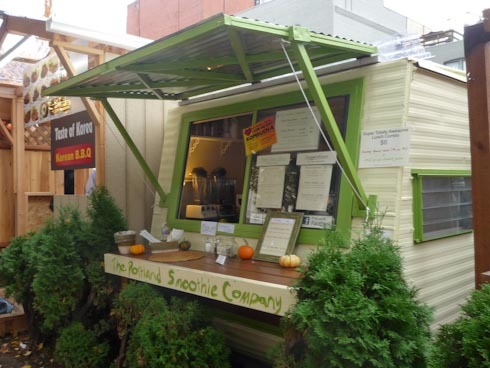 Business and competition in mobile dining are both on a radical upswing in the midst of this recession. Office parks ae swarmed at lunchtime, and savvy culinary marketers tweet their locations outside a hipster bar here, a street festival there. Personally, I prefer being waited on, but it’s an undeniably big trend. Any idea of why it is not more common? Are the trucks making money? Thanks Andy. That answers a lot of my questions. Seems like their growth will therefore depend on citizens pressuring cities to permit them. Nice job doing the research. Thanks. FoodShark in Marfa TX is a stellar example of a small business using social media such as facebook and twitter to build a surprisingly large customer base. It seems to me that this requires communications skills not every one has, however. It will be intesting to see how this evolves. There is the demand for them in Minneapolis, but the ordinances kill them. It’s a long tedious process to get a permit for a food truck. Food stands are wildly popular at our state fair, yet we can’t get them on the streets. Sacramento, CA has similar ordinances. I have to believe that the local Restaurant Association or Chamber of Commerce lobbies for such ordinances. Austin TX has enough food trucks/trailers to supply Midland and Abilene which are underserved. Like that’s gonna happen… These are not vibrant communities because no one, not a single citizen in all of West Texas cares about being vibrant. Or they would be by now. 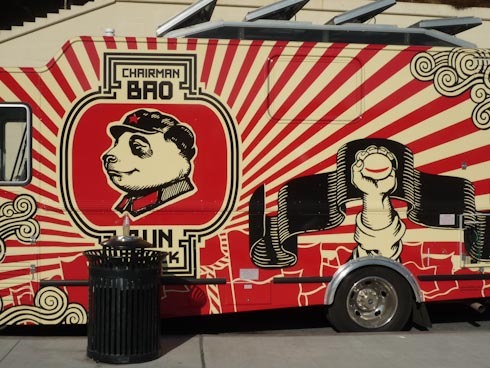 Food trucks are on the rise and are encountering different obstacles in different locales. Business licensing, health codes and consumer habits each play a role. But that’s changing, especially with companies like Jack in the Box getting into the food truck business. I attribute their recent growth to the confluence of the tight credit market and gourmet/local slow food movement. 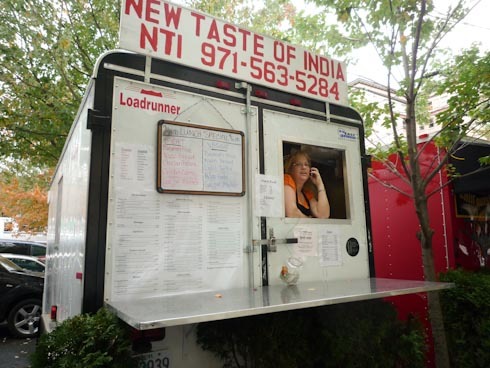 Clover Food truck in Cambridge, MA & South Station in Boston came about because the tight credit market made it impossible to get the capital for his new traditional restaurant. Instead, he opened the truck, expanded to a second and is new opening that traditional spot. Food trucks are definitely trending. 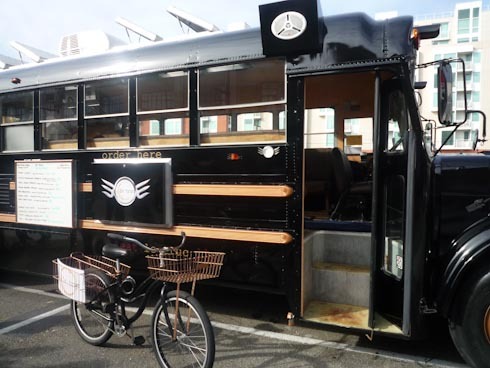 When I published this post about this year’s SXSW and how food trucks could be a model for social innovators, it became the highest trafficked blog post this year – due mainly in part to being picked up by WordPress’s Freshly Pressed. People are passionate about their favorite food trucks. I expect this to became even a bigger trend and welcome the creativity it represents. For sure, when I travel the country and the globe, I seek out great food carts and trucks. It’s one of the best ways to understand and experience the local culture. Every town and country has a street food they’re proud of – Amsterdam’s herring sandwich or Strupwaffel, for example. If food trucks made good business sense — which is what I think you are saying — then the reason we don’t see more of them must be regulations of some sort. That we can change. BTW, in parts of the globe where there are a lot of food carts, there are also lots of restaurants. Yes, the business model doesn’t fit nicely in most existing municipality codes. The codes will change because of the economic benefit they’ll bring. And food lovers will enjoy the higher density cluster of food options they will spur – cars, trucks & restaurants. Glad to see such interest in the Mobile Food Industry! Come and visit MobileFoodNews.com for the current “SCOOP”! They’re all over Los Angeles these days…perfect for a city of cars..
Denver has a vibrant and growing selection of street food, including innovative “foodie” fare, like truffled macaroni and cheese balls. Some trucks are affiliated with a “four wall” business, and some are stand alone. Out of curiosity, what is it about Food Trucks or street food in particular that provoked this article? There are other manifestations of the same theme, e.g. popup restaurants, subscribing to individual chefs, supper clubs, dinner co-ops that are starting to take hold. Generally though I agree with you, I’ve felt for a long time (particularly being vegetarian) that there are a dearth of dining options. 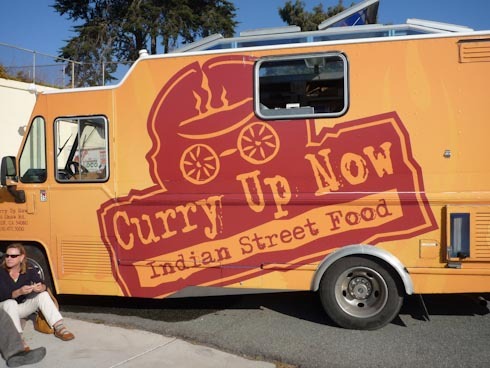 When I was in India for a short period of time starting an office there, I was amazed by how much variety in street food and small shops there were to eat at..
All food trucks are nicely designed with good graphics. I also tested their foods and some foods are excellent in the taste.